Found 12 file extension associations related to Stronghold 3 and 9 file formats developed specifically for use with Stronghold 3. Your castle walls are being smashed by siege engines, an enemy catapult surrounded by troops is rumbling ever closer, your villagers are starving, wolves have been spotted in a nearby cave, your barracks are desperately empty... just another typical day for a medieval lord in FireFly Studios' Stronghold 3. 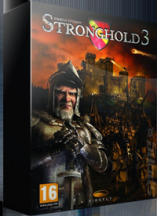 Since first launching in 2001, the Stronghold series has become one of the most respected in its genre thanks to its mix of precision village building, fast-paced real-time gameplay and dramatic sieges with hundreds of enemies swarming over your castle. Stronghold 3 promises to be the best yet, with a keep full of fantastic new features that ensure old and new fans alike experience a gritty slice of medieval life. If you need more information please contact the developers of Stronghold 3 (Firefly Studios Ltd.), or check out their product website.